Innovative, challenging and a charming Puzzler. When “Baba Is You” by indie developer Hempuli was first revealed back in December of 2017, I was fully on board with the game and very interested in giving it a go. A bit more than a year later, Baba Is You has finally been released and the question stands, does it meet my expectations? Rest assured, I can safely say Baba Is You might as well be considered one of the smartest and most innovative puzzlers that have released in recent memory. It takes the saying “Thinking outside the box” to a whole other level, with over two hundred unique levels that require different methods and solutions to solve. For those of you that know a bit of programming and coding, you might be familiar with the terms “if” and “then”. 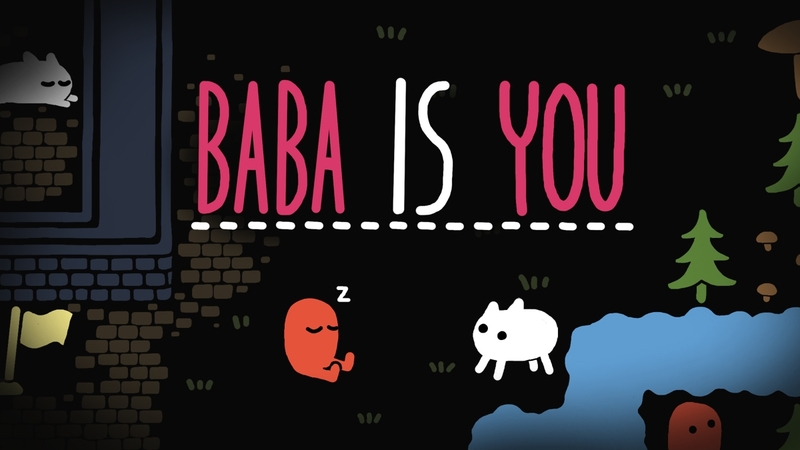 Baba Is You goes all out with this concept and fleshes it out into a complex puzzle game. The gameplay revolves around manipulating the rules to reach a specified goal. These rules are represented by tiles with words, and they can be pushed from one place to another. For example, if the flag is surrounded by a wall, why not change the rules so that you become the wall; if there’s a pool of water blocking your path, change the rules so that the water floats and you can pass underneath. You can change the rules of the physics, interactive objects, amongst other things by simply changing the commands. Using the words at your disposal, players can mix and match to change the way the stages work. Baba himself can become an object or be something else entirely. Later on in the game you encounter elements like “and”, “has” and “not”. These elements open the gates to a completely different layer of challenge and complexity in the later sections of the campaign. Baba is simple to control, you can move and push objects. Additionally, with the press of a button you can redo a previous mistake, making it easy to retry anytime you want. There’s also a button to reset everything and retry the level from scratch. The controls are very minimalistic but work great with the game’s mechanics and visuals. Baba Is You doesn’t contain a story or any extra modes. The player starts off with a quick tutorial on how the game’s main gameplay mechanics work and right after that gets placed right into the action. As mentioned earlier, there’s over two hundred levels in the game. To my surprise, most of the levels stand out from one another. The solutions to these stages are unique and the game frequently adds new elements to keep the game from feeling repetitious. The only noticeable issue is the questionable difficulty curve with these levels. Early on in the game you’ll quickly encounter levels that are either very easy to complete, while others can take a few dozen minutes to beat. This continues throughout the entirety of the game, I’ve encountered roadblocks that can take over half an hour to complete. Unfortunately, there’s no hint system in the game to help out, so I either had to rely on the internet or trying out everything I could to solve it. The level difficulty varies with each player, some of these were a breeze to complete while they proved challenging to others, and vice versa. In the game’s settings, you can find some additional options like a grid to the levels, disabling wobble effects, and some other nice features. You can also make up to three files to replay the game, instead of needing to erase your current file or having to create another account. The game’s presentation is minimalistic and adorable as well. Usually there’s a singular colored background, some simplistic designed objects and a giggle effect to everything. The presentation works great with the gameplay as it never gets cluttered with anything that isn’t part of the level. Usually everything has a purpose in the stage they’re in, and having a simple presentation helps these elements stand out. Baba Is You’s soundtrack, composed by Arvi Teikari, has a total of 14 themes. The tracks have an 8-bit feel to it, with most of them being soothing tracks. My only issue with the soundtrack is that since some stages can take a long time to complete, and there aren’t many themes in the game, most of these tracks end up being repetitious. I tended to mute the game while playing after long play sessions. Baba Is You is smart, it’s unique, it’s innovative. The core concept is strong, and there’s a lot of content and gameplay elements to keep the players entertained for the entirety of its run. The only flaws are the difficulty curve and a lack of a hint system. Overall, I highly recommend playing Baba Is You, it’s a puzzle game worth playing to the end.